Two locations in Wales have been shortlisted to become one of four off-site logistics hubs for the Heathrow Airport expansion. ABP Port of Cardiff and Shotton-based Tata Steel are on the list of 18 potential UK sites to help with the third runway plans. There were initially 121 applications for the hubs, which was reduced to 65. 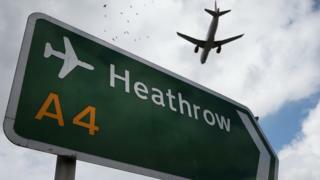 They were visited by Heathrow officials last year before the list was further reduced to 18. The winners will be announced early next year, with work due to start in 2021. The third runway could be completed by 2026. The hubs will preassemble components for the new developments that will accompany the third runway before transporting them to Heathrow - with the aim of streamlining the construction and minimising the disruption to the airport. Shortlisted sites will now be invited to enter into a formal tender process. Minister for Economy and Transport Ken Skates said Welsh logistics hubs would bring "huge benefits". "We have a proven track record in the construction and manufacturing sectors, a readily available and highly experienced supply chain and skilled workforce. "Welsh logistics hubs would bring huge benefits to the people and businesses of Wales, creating jobs and supply chain opportunities and also leaving a skills legacy for future generations." Bill Duckworth, Tata Steel site manager at Shotton, North Wales, said: "This would present an ideal opportunity to work hand-in-hand with Heathrow not just as a hub, but possibly as a major supplier of construction materials too. Matthew Kennerley, Director, ABP South Wales, added: "Our port-based site offers excellent multimodal connectivity in the heart of Cardiff, the fastest growing capital city in Europe."